Adverse driving conditions in the winter time are the number one reason for car accidents in Toronto, London, Peterborough and other parts of Ontario. Snow, Ice, Slippery Roads and other winter hazards cause car accidents. These accidents can result in serious personal injury. Goldfinger Law has been handling winter hazard and winter car accidents for years. 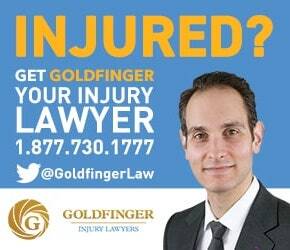 If you or a loved one has been involved in a car accident on account of poor winter road conditions, or another driver losing control of his car because the road conditions were bad, call Goldfinger Law for your free consultation with a personal injury lawyer. Toronto, London, Peterborough and other parts of Ontario don’t have mandatory laws requiring drivers to get winter tires. But, Quebec does. Winter tires are specifically designed and engineered to provide increased grip to cold concrete, and when driven on slush, ice and snow. They are designed for the cold, like we see in all parts of Ontario during the winter season. Winter tires can help prevent car accidents. The idea of requiring all Ontario drivers to use winter tires been tabled in Ontario legislature, but making Ontario drivers get winter tires is still not required. Studies have shown that winter tires will increase your grip in the snow, or on cold, wet or icy roads. This will give the driver greater control of their vehicle during the winter months and reduce the possibility of losing control of your car on account of poor road conditions. If every Ontario driver had winter tires, it’s likely that the amount of winter related car accidents may reduce, but studies have yet to prove that. On the flip side, some drivers with winter tires feel so comfortable and in control of their cars driving with winter tires that they chose to drive faster and more aggressive in snowy and icy conditions. This may increase the impact of a car collision and result in more damaging personal injuries. If you’ve never driven with winter tires, Goldfinger Law highly recommends trying them out. If winter tires prevent one car accident, then they’ve served their purpose.